The Veer Lofts was Vulcan’s first residential condo development in the soon to be rejuvenated South Lake Union district. 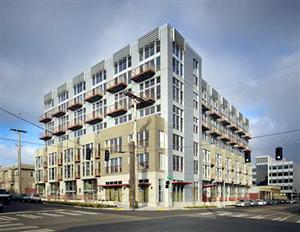 Completed in 2008, Veer features 99 heavy timber constructed one- and two-level lofts and single-level flats ranging from 680 to 1,100 square feet. Interior finishes will include European styled kitchens, exposed wood ceilings, concrete floors, 9′-16′ ceiling height and natural finished. Unlike what many homebuyers expect when compared to the other projects in the area, the Veer is entry-level and it’s interior reflects that. Interior finishes include laminate cabinets, bright colored vinyl and stainless steel backsplashes. It does have an industrial feel that replicates a true loft feel. The building is pet friendly and will provide residents with a roof top deck with BBQ and bocce ball court (east side of building, not above the 6th floor) and a washing station in the garage. Each unit will come with one parking space and one bike storage space in the state-of-the-art bike storage room, and one storage space.